As the move to modular construction gathers pace, what are the key design drivers when tackling a modular project, and how do we learn from the mistakes of past failures? The first thing to say is that traditional architects are not best placed to design a modular building, as the process is not something that sits well with designers: terms like ‘standardisation,’ ‘repetition’, and ‘designing from the plan’ (not to the urban context) send shivers down their spines. It requires a fundamental shift in thinking from a contextual urban design response to a manufacturer-led production mindset. The starting points are simple – it must be designed as a modular building from day one, translating buildings post-planning into modular designs is costly and inefficient. The second key building block is a project must be based on production design parameters. Seems simple, but if you are to manufacture something it needs to be the same component and not many variations of a component. 80 per cent of the building needs to be ‘the same’ – not ‘almost the same’ with many minute variations, but the same. What do we mean by ‘the same’ however? What elements can be fixed and what elements are open to variation? The answers lie within the production process, and are in common with the car industry. Customisation is just that, you can amend a standard product through product variation: an example being that a Tesla and a Fiat use the same wiper motor and accelerator foot pedal, but look completely different. Most cars within a range sit within the same frame, but the panelling is never the same. The engine block is the same across many cars, but the speed possibilities vary due to customisation. The same is true with buildings. The overall frame size needs to be the same, height, width, depth, the internal arrangement doesn’t. The windows’ position needs to be the same size and location, the cladding doesn’t. The M&E systems need to be in the same locations, with the same basic layouts, but upgrades and site variations can be accommodated. The best example is the Victorian house. These are essentially the same design and layout, but infinitely customisable. You will never hear a planner or homeowner object when you say you want to drop a replica Victorian terraced house into a street, but all hell breaks loose when you suggest you want to put in a modular home. Victorian bedrooms are roughly the same height, width and length, they tend to have bay windows and marble fireplaces, the same chimney design, I could go on. This is the ultimate modular prototype house. They rarely have the same window detailing, but all have the same bay window construction method. All are stock brick, with colour the only slight variant, yet no one is complaining they are of a highly repetitive design, if fact the opposite – the regular rhythms of this design is highly sought after. The facts is that the loss of the quality of house design since the Victorian era in the UK is based around the poor planning system, combined with developers seeking profits. There is a real fear this already low base of design quality that is prevalent in the UK will be further exploited by developers using cheap modular system design. Modular design is associated with the failed experiments with prefabricated concrete panels and prefabricated schools, both standout examples of the poor quality planning system and cost-driven design. The use of repetition was excessive, while no design controls were employed to harness the qualities of repetition. To optimise modular building design, we need to move the conversation on. “Repetition refers to one object or shape repeated; pattern is a combination of elements or shapes repeated in a recurring and regular arrangement; rhythm – is a combination of elements repeated, but with variations.”* The modular unit is the starting point for the design and not a design feature, unless, like the CitizenM hotel group’s approach, it is the design motif in itself. It is important that designers don’t attempt to reengineer a traditional facade concept back into a modular product. To create a pattern using modular design you need to start combining the units into a larger grid, either to relate to the existing context by reducing the grid, or descaling the building into a modernist approach by combing the units. To bring rhythm into the equation, you need to combine the patterns into blocks which can relate to the surrounding context. 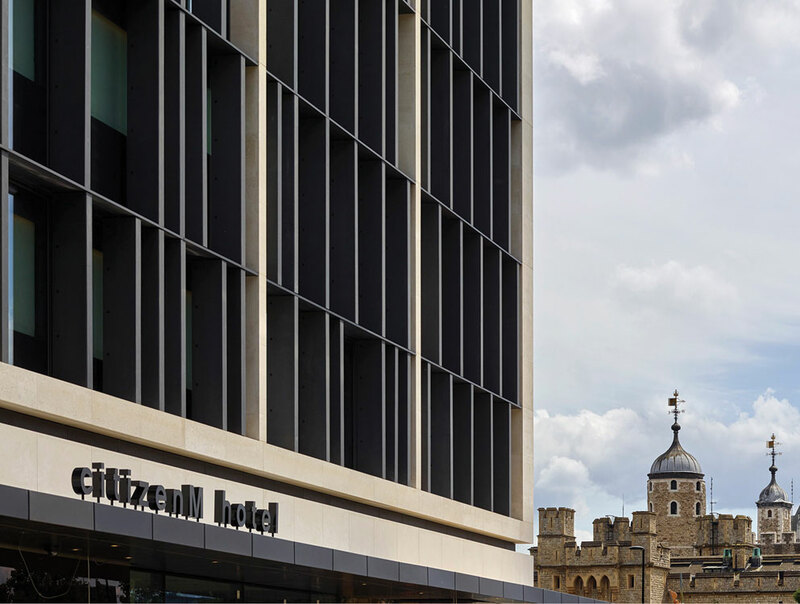 This approach can be seen in our design for the CitizenM Tower of London, where the Dutch love of modernism had to be tempered with the English love of context, given the site’s UNESCO World Heritage listing. Here the same modular units were used throughout and the window was fully complete in the factory, including water tightness, fire and acoustics. An external skin was applied to locate the building and move it from a modular expression to a piece of contextual architecture. A veil of fins was applied to the windows to create pattern, with a continuous rail used to vary position. Despite the appearance of randomness, 50 per cent of the fins hit the line of the modular grid. The rhythm was created by combining the modules into classical bays using an overclad Portland stone system supported from the modules. All in all, this building has never been exposed as a modular building and sits within numerous conservation zones and a World Heritage listing. This approach can be used in a historic context but if you need a truly traditional brick facade or hand set stone, it is technically feasible to complete the facade in the factory and overclad using a traditional method. There are only minor impacts on the programme benefits, if the facade is detailed correctly. The best approach is to embrace the pattern and express it using modern, lightweight materials, like our Marriott project at Luton airport, celebrating the rhythm with an angular facade. There are no real limits to the design possibilities – just the limits of your imagination and understanding of the principles. Like every cladding design of course, it needs to adhere to rules like fixing point, deflections, and glass size. When approaching the planning of a modular building, the plan must be regular: based on components that are repeated. Variation, however minor, leads to additional unit counts which affect price and ultimately the viability of a modular build. As a rule, 80 per cent of the building should be the same unit and the remainder can vary, usually around the core and the ends of the building to maintain efficiency. The blocks should be stacked vertically, and M&E should run straight down – this makes sense in any building. Variation of design should be as the Victorians did, in the detail rather than the plan. Best to regain the respect the Victorian architects had, by reintroducing high quality housing using component-based design.